We live in an age of data-centric, always on organizations. Your data protection solutions need to keep up. 2017 Gartner Magic Quadrant for Data Center Backup and Recovery Solutions. IBM has been recognized as a Leader for 7 years in a row. IBM has removed the complexity from the data protection equation, with fast installation, seamless management and push-button data recovery. You can easily manage rapid virtual machine deployment, as well as complex global enterprises that require advanced data governance. "IBM’s Spectrum Protect offering boasts more than 20 years of achievement in the protection and recovery of key IT systems. 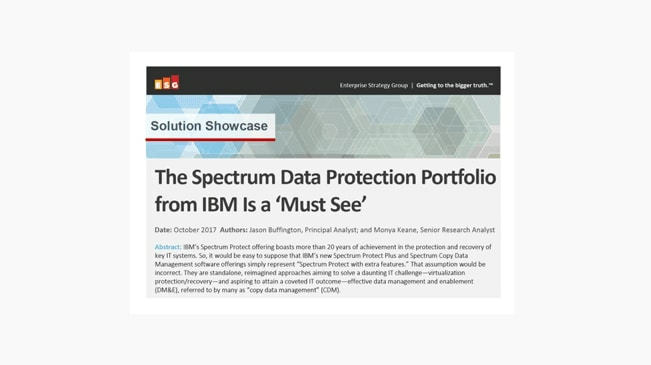 IBM’s new Spectrum Protect Plus and Spectrum Copy Data Management are standalone, reimagined approaches aiming to solve a daunting IT challenge—virtualization protection/recovery—and aspiring to attain a coveted IT outcome—effective data management and enablement (DM&E), referred to by many as “copy data management” (CDM)." The recognized leader in enterprise backup, IBM provides a simple user and administrator interface with a single point of control for managing data protection, whether data is hosted in physical, virtual, software-defined or cloud environments. You gain ease of deployment, management and recovery for VMs and application data. IBM Spectrum Protect™ reduces backup and recovery times from hours to minutes for critical data and VMs. Simplifies data recovery and access for virtual machines. Can be deployed in minutes and protect your environment within an hour, as a standalone solution or integrated with IBM Spectrum Protect to offload copies for long-term storage and governance efficiently at scale. Reduces backup infrastructure costs up to 53% with deduplication, incremental 'forever' backup, policy-based administration, and flexibility in your choice of storage. Offers backup, snapshot, archive, recovery, space management, bare machine recovery, and disaster recovery. Next-gen data protection and DevOps snapshot management makes copies available when and where consumers need them, without creating unnecessary copies or leaving unused copies on storage. Deploys as a virtual machine in about 15 minutes, and can coordinate sending data to AWS S3. Non-disruptively deploy Cloud Object Storage in IBM Spectrum Protect environments to help reduce costs and improve scalability and efficiency. Some data needs to be stored for decades. Learn why adding tape to a cloud infrastructure can reduce costs and maximize scalability, efficiency and security. No business can tolerate downtime. Learn how we can help you maintain continuous business operations and improve overall resiliency. Non-profit healthcare provider improves data backup and compliance while lowering its total cost of ownership by 27 percent and reducing backup volumes by 2TB. 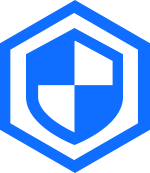 IBM Partner utilizes IBM Spectrum Protect to solve data protection challenges for any sized organization by protecting and recovering data hosted on-premises and in the cloud. Financial Services provider realized increased customer satisfaction, fast failover of backup environment and annual cost savings after deployment of IBM Spectrum technology.